Moscow, the city that never sleeps. Russians love new things, get bored with what was new a year ago, and when it comes to spa, the key is to have many small brands. Preferably known brand, but not those that can be bought elsewhere. And instant results, that are not only felt but seen. We have gone around to lots of spas, but to be honest the spa market is just beginning. Mandara has a good spa here, Intercontinental just opened 2 weeks ago (we did the spa..so it is of course great), Ritz has an Espa spa, Swiss hotel Purovel spa is really good but there are not so much more. For a city with 17 million people, this is definitely an opportunity IF you understand the market. And the market is complicated, with all its hidden values, rules and of course beaurcratic certificates. The Dominique Chenot spa outside Moscow is beautiful, but the problem is that the presidents wife likes to go there (lives close by), and she calls 30 min before she goes, and then everyone has to leave straight away, no matter if you are in the shower, having a massage or swimming! Not that easy to run a spa then…..
What we LOVED was Madonna’s new club Hard Candy, that recently opened. It was not so much the club, but the atmosphere, great personalities working there – hip but also extremely friendly. The very gay “Stiletto Fitness” (yes fitness and class to walk in EXTREMELY high heels) was to die for, “Belly dancing” so much fun and I have problem walking still since my “Kettlebell Power”. Membership from €4,000/year – and yes, it is worth it! Also went to Sandya Banya, rented a VIP room to experience the real Russian deal, and there you start with some drinks (we skipped the vodka) and pancakes (it is pancake week here), and then off to the special Banya treatment, where again we were whipped pink by oak veniks (whisks) and then had a superb soap massage. Therapist was excellent and it was like a massage, but with soap and then just a very quick (but hard!) scrub. Loved it! 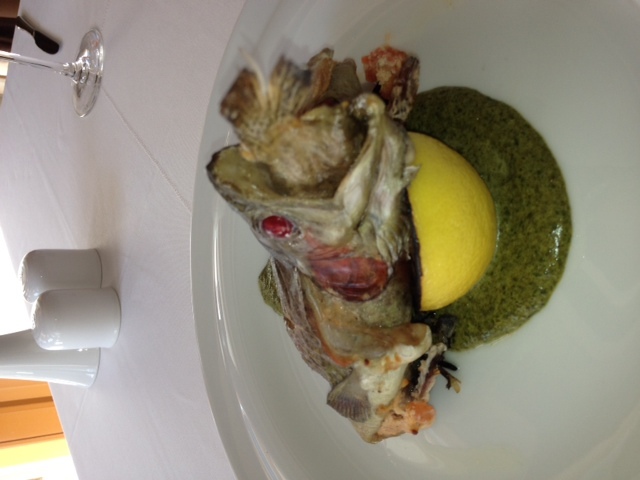 Perhaps not equally happy with the fish (picture) that I ordered the other day, but at least it caught my attention. 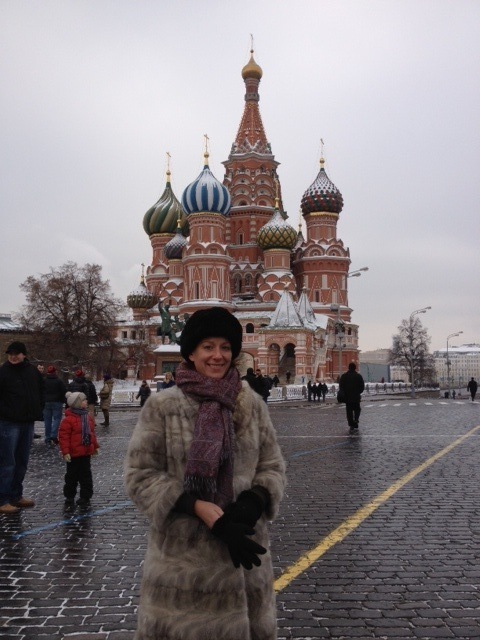 Of course, you can’t go to Moscow without going to the Red Square (me on the picture) and learn about its fascinating history. And seeing Putin passing by really quickly (he closes the road when he is going somewhere and you wait for about 30 min). Tomorrow on my way home!